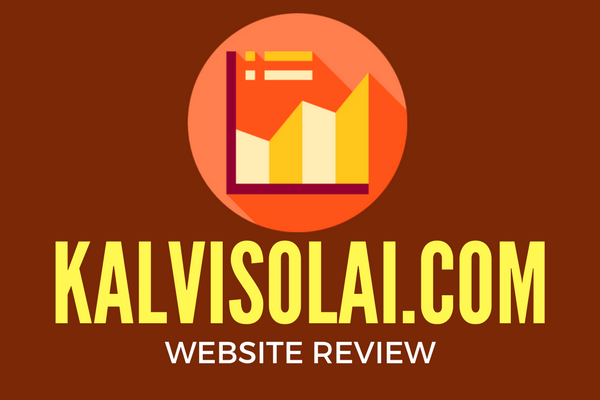 Kalvisolai.com is one of the portals which are fully for the education and it provides for class 10th and for 12th standards. This portal provides study materials, previous year question papers, answer key for the question which is asked in the exam and online test for the upcoming board examinations for the students who are going for the board exams. The study materials are for the subjects like Tamil, English, Mathematics, science and social science for both English and Tamil medium based on their syllabus. This portal is not only for the school students it also provides study material for the teacher who is going to face the exam like Teacher Eligibility Test (TET) Exam, Teachers Recruitment Board (TRB), Tamil Nadu Public Service Commission (TNPSC), Green Olympiad exams and other competitive exams. The materials are available on the site and audio, video formats are also there which are offered by the portal. This portal provides much information about the General Counseling for the upcoming year to the teachers regarding the DEE new Transfer application, Promotional panel, DSE teachers’ manual transfer, and spouse certificate and so on. The exam notification is also provided in the portal where you can find the exam dates and upcoming exam. In order to avoid confusion, this portal gives free advice about all the courses for the 12 graduates. kalvisolai latest news today updates provides all newspapers and other education news about tnpsc, tntet separate sections. The news is the information about the recent updates and events. This portal offers you all type of news such as Employment news, Latest News, Flash news, smart news, education news, TET news, TRB news, TNPSC news, general news, school news, college news, exam news, result news and admission news. The important News and the upcoming events are scrolled in the main page of the portal so that we can update ourselves just by clicking the News. Here we can check the board result without wasting our time. By browsing the portal we can update ourselves about the government exam and the vacancy for the post. The previous year question papers are provided with a download link so, the user can download the questions papers as per their wish. This portal also contains question banks for one mark questions for all subjects and this also give a special guide for the students for how to prepare for the board exam, how to revise fast and special guide for a way to success for each and every subject to the students who had fear to face the exams. So from this guide student can easily face their board exams easily. The online exam provided by the portal is for both classes 10th and class 12 for all subjects in chapter wise. So the student has a lot of questions to solve and they can easily face the exam. You can download the syllabus for the entire exam in PDF format, video format and even in audio format. Separate links are provided for each and every category in order to avoid the confusion among the users and some of the links are given below for your reference. Sir please publish +2 supplementary biology &botany question paper.